With truly magnificent timing, the Thirds knocked off second placed Beaumaris last weekend and have gone to equal second on the Thirds Section 2 ladder, to set up an all-important clash with Williamstown CYMS for Fan Day at Ramsden Street tomorrow. The results this weekend have big consequences for the final four. On form, you’d have to say Fitzroy may well finish the weekend sitting in second spot, if they can take the points at home. With second-placed Beaumaris up against the undefeated De La Salle, a win for Williamstown with their superior percentage would see them leapfrog the competition into the top four. Last weekend’s Fitzroy win over Beaumaris was the result of a 10 goal to two final quarter. 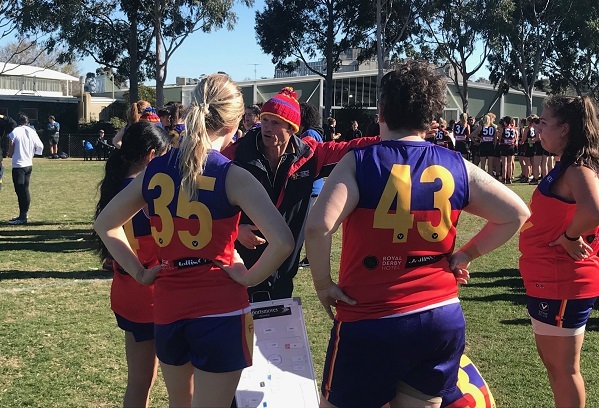 It was tense and tight at three quarter time, with Fitzroy leading by just three points and having scored only one point for the quarter. The blistering run home with the help of the wind certainly shocked the visitors. The final score was 19.12.126 to 11.5.71. Captain Tim Denatris kicked another five goals to edge him just a little bit closer to the section’s top goal kicker. There are now four goals separating him from David Cowley of Old Trinity. Sharing the love around, Ezra Darby kicked four, Liam Webb and Bryce Mcadam, three each. Gizzy Mills and Hugh Morris-Dalton were two of the best payers for the day and it’s good to see Will Symons back in town and onto the best players’ list. There’s a lot at stake for tomorrow! 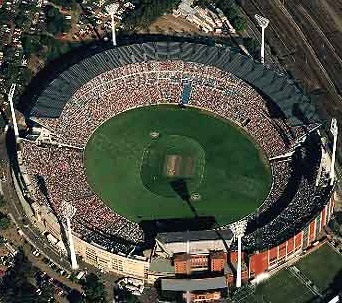 All the more reason to get a huge home crowd down to Ramsden Street, where the boys are planning some extra excitement. There has been a lot of preparation for the day and if you’ve been following on Facebook, you will have seen some of the team’s creative work – if you haven’t, get online and join the party. Expect to see banners, footy cards, a kicking competition, a meat raffle and prizes but most of all just some top class footy with huge bearings on the final four. Rumour has it, there will also be $10 souvlakis and that the Richmond v Collingwood game will be on in the rooms after the game. It will be cash only so bring some extra change to be part of the excitement. Who doesn’t want an Adam Taib badge? Check out some of the old-style player profiles the boys have put together. For the rest of them, head to Fitzroy’s Facebook page. 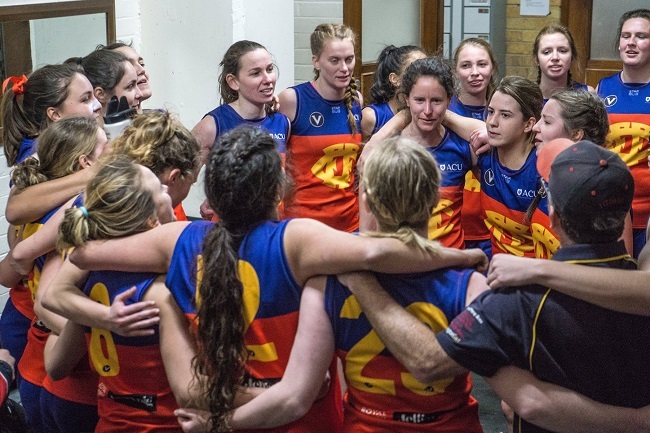 With a huge travelling fan club on hand and a lot of talent on the sidelines, Fitzroy turned in perhaps one of the best performances of the year to put its top two spot beyond doubt for season 2018. 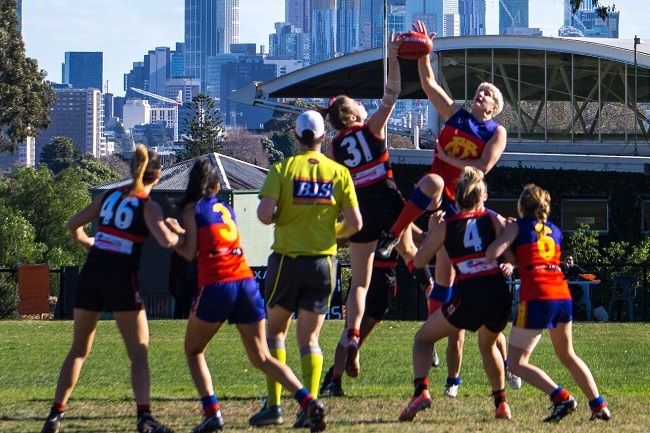 In a game that shaped as a danger contest against third-placed Old Camberwell, Fitzroy put in a strong four-quarter performance. Where to start with the highlights? Was it Gaitor with the Dusty-like double fend and dash through the midfield with the ball held in one hand? Was it Sunny Brazier’s goal from outside 50 to go with three others for the day? Was it the Clayton to Clayton goal and the twins causing the supporters to battle it out over which one was more outstanding on the day? The gang tackling? Martin Deasy ducking and weaving? Or perhaps the hardness of young guns Jimmy Butler, Donovan Toohey, Gus Richardson and Jack Hart, taking on more responsibility each week? Does it really matter when you win by 10 goals? The final score was 17.7.109 to 7.8.50. On a day when everyone did their bit, it would be hard to single anyone out. Luckily that job went to the coach and in the absence of a lot of experience, it is no surprise that Rory Angiolella bobbed up to take best on ground honours with his usual combination of toughness, flair, game smarts and some outstanding tackling. In the experience department it was also great to see Will Fenton back in the Senior side and there were quite some celebrations when he kicked his first goal. It is a bit of a shame to have Sunny and Jack heading back to TAC world this week, but rumour has it, one Nino Lazzaro could make a surprise appearance at Keysborough and the inclusion of Sammy Baker and Tom O’Donnell is a massive bonus. The senior players asked for a special mention to go in this week’s Red Roy Mail, simply thanking the large contingent of Fitzroy fans who travelled to Gordon Barnard Reserve in Balwyn to cheer the team on. Probably outnumbering the home supporters, it gave the players some added strength and encouragement and the wild cheering from the sidelines was certainly noticed on field. If you want to see what they were cheering about, do yourself a favour and check out the quarter three replay; champagne football. The Reserves also got the job done against Old Camberwell but the home side took it right up to the ladder-leaders and made them fight all the way for their victory; perhaps a good thing leading into finals. Will Pickering proved the difference with five goals, ably supported by Chris Brown with three (the two are pictured). Captain Jack Atkinson always shows his true grit in the tough contests and was best on ground for Fitzroy, ably supported by Angus Ryan and Mitch Bottomley. The final score was 12.10.82 to 9.4.58. This week the Ressies and Seniors are away again and meet Old Mentonians at Mentone Grammar Playing Fields in Keysborough. The whole club will don black arm bands for tomorrow’s games in honour of Kerry Murphy, who passed away during the week. Kerry is the eldest brother of club Director, Gabrielle Murphy, and uncle of senior player Max Ellis. Our love and condolences go to the extended family at this sad time. 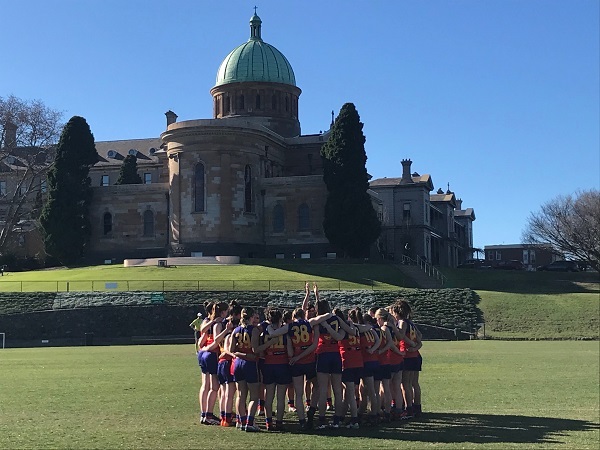 St Bede's Mentone flexed their muscles and piled on the goals against Fitzroy's Under 19 side last weekend, working their way into fourth spot. It was a very difficult day for the Roy Boys who suffered a 105 point loss at Brindisi Street. Rory Patterson, John Jorgensen and Marcel Laidlaw, continued to provide avenues to goal, as they have done all season and between them kicked the team's five goals. Patterson was best for Fitzroy with Liam O'Connor and Noah Wright putting in a huge effort for the day. The challenge now is to stay focused and take as much as possible out of the season with four games left and unfortunately no chance of playing finals. This weekend the team will take on University Blues, which will be a tough contest as the Blues still have a rough chance at making the four. 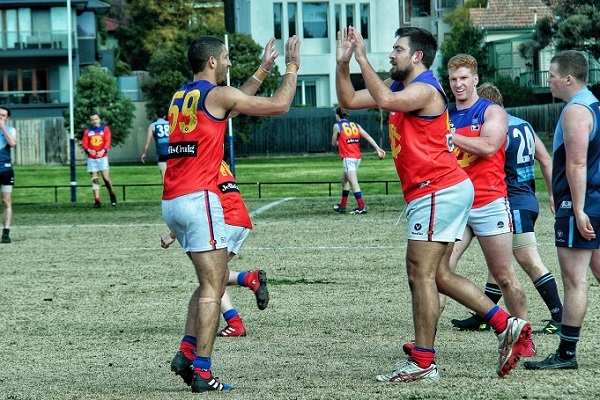 Both Fitzroy-ACU teams turned on some excellent footy against Old Xaverians on Sunday. In their final home and away game, Fitzroy-ACU Reserves tuned up nicely for the finals with a dominant performance but will be doing some goal kicking practice during their bye week, after returning a scoreline of 5.17.47 to one point. Tess Plant-Thomas was simply outstanding with three of the team’s five goals. She was well supported by her captain Rachael Telfer, who is getting stronger with each game after an injury affected season, Susie Worthington, Martha Loughnane and Siobhan Williams. The team benefitted from having Bridie Murphy back in the engine-room, after a few weeks with the Senior side, and despite copping several heavy knocks, she kept throwing herself back into the contest. With a bye giving them an automatic four points, this weekend all eyes will be on the result of the game between Marcellin (first) and Caufield Grammarians (third), which will determine the make-up of the final four. 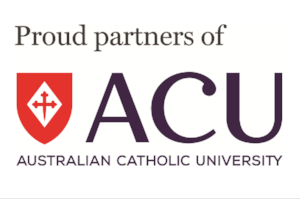 Fitzroy-ACU will be looking for Marcellin to win big and make up a deficit of 19 per cent, which is what is currently keeping them from hosting a home final. Meanwhile, despite missing a finals spot this year, the Senior side is finishing the season strongly and really turned it on after quarter time against Old Xavs on Sunday. Kicking four goals to one in the second quarter with the wind and scoring one whilst keeping Xavier goalless against it in the Third, were the two big keys to breaking the game open for Fitzroy-ACU. The final quarter was all attacking with plenty of highlights as the Roys’ scored 3.5 for the quarter. There were strong performances across the ground, but Lucy Kerr (1 goal) continued to star, along with Jess Hayes, Alex Monacella (2 goals), Camille Augustin, Alice Batterton (playing her 50th game) and Erin Gogerly (2 goals) were named as the best for the day. It was in fact a very even contribution, with Freya Shearer also looking the goods in her first Senior game, kicking a goal for good measure. Hillary Collett kicked a couple of beauties and Liz Olney also hit the scoreboard, playing an excellent defensive game in the forward 50, bringing the ball to ground for her teammates throughout. The pics in the top gallery are a small selection from Don Gogerly. 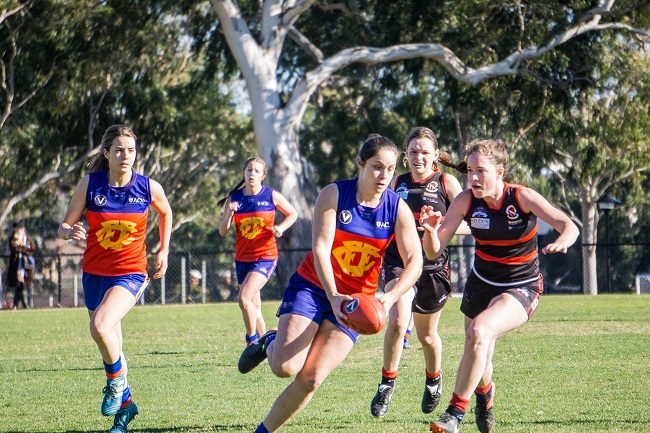 This weekend is the final game for Fitzroy-ACU Seniors and unfortunately the game time has been changed due to a clash on the Old Trinity grounds. The game against Old Trinity will now be played at 12pm at Daley Oval at Trinity Grammar, Bulleen Rd, Bulleen. They cannot finish lower than fifth in a season that had the team frustratingly on the wrong side of a number of close losses and a draw. But as always, there have been plenty of highlights. Check out this week’s Risk Care Round up to get a great sense of their best footy. The Risk Care Round up also helped relive some of the fantastic goals in last week’s Senior games. 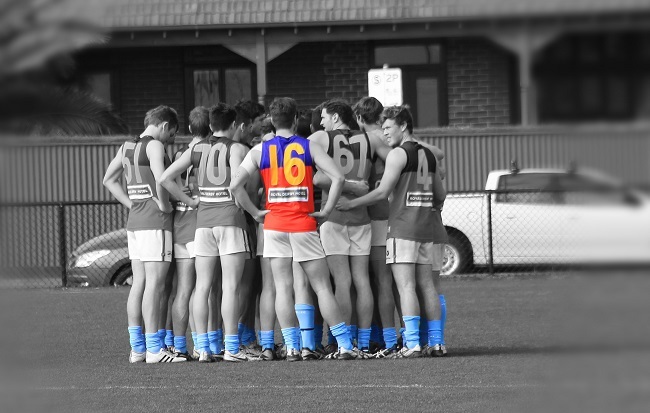 This weekend you will see Fitzroy’s teams in pale blue socks denoting that we are participating in the VAFA’s Thick & Think round to raise awareness and start conversations about mental health. You may have seen some coverage during the week of a campaign launched by Headspace, encouraging young men to talk about their mental health and wellbeing, featuring Western Bulldogs player Tom Boyd (you can read about it here: https://www.theage.com.au/sport/afl/couldn-t-sleep-couldn-t-train-boyd-opens-up-on-mental-health-issues-20180724-p4zt7t.html). Part of the aim of this weekend’s round is to create an opportunity for a mental health focus; to encourage conversations and normalisation of mental health concerns so there can be greater awareness of the signs of mental health issues and the ability to point people in the direction of help. 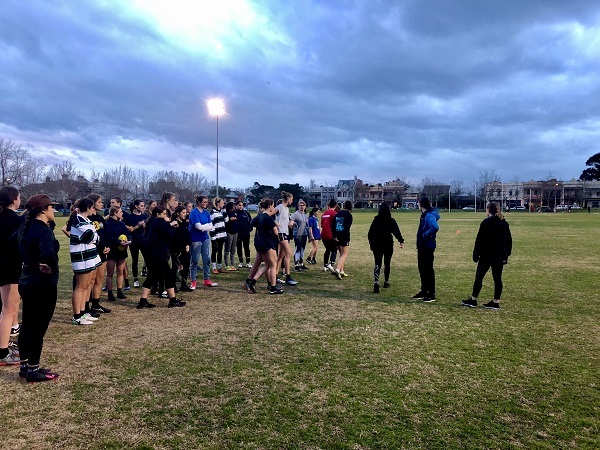 Fitzroy players, like many other VAFA players and clubs this week, have taken the opportunity to start their own conversations about these issues. 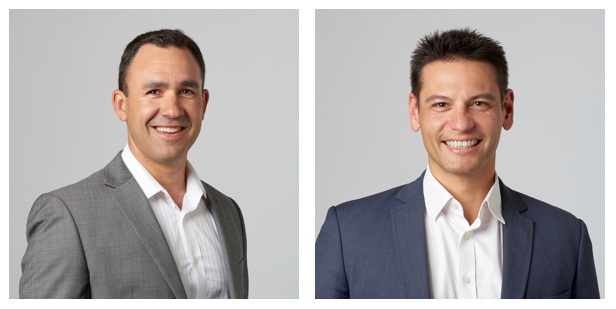 Sign up for lunch with Dan and Dave, one not to be missed! After years serving in the Australian Defence Force, including stints in Iraq and Afghanistan, Dan Cairnes and mate and fellow serving officer Dave Farrell are rebuilding their lives in Australia and assisting other military veterans to do the same. On Saturday 11 August, at the lunch that precedes Fitzroy’s match against old foes Ivanhoe, you’ll have the privilege of hearing from veterans Dan Cairnes and Dave Farrell. Dan and Dave will share their experiences of life during and after their distinguished military careers, and explain how their work as founders of social enterprise, Veterans in Construction, is assisting returned servicemen and women at one of the riskiest times in their lives, ironically, their return home. Some people casually liken the football field to a battle ground. But in their heart of hearts they know that such a comparison is as fake as anything Trump and his detractors could trump up. Dan Cairnes thinks there are some comparisons that pass muster though. “The leadership and resilience displayed in football definitely has crossovers into your professional and personal endeavours,” he says. “The military trains its people hard, often to failure. The reason for this is that you learn by your mistakes. Dan says that following Aussie Rules while in the Army was hard at times, particularly in the northern states where Rugby and League have a greater following. 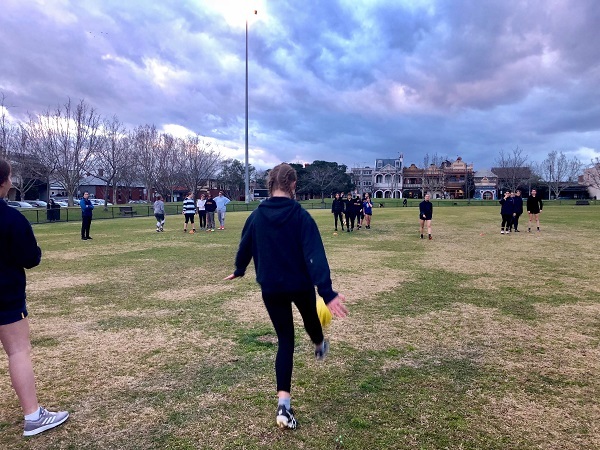 Now a local living in Carlton North and with a number of kids in his street play in the junior grades, Dan’s been able to catch a home game at Brunswick Street Oval. So now that he’s within a stone’s throw, we plan on recruiting Dan as a regular Roys’ supporter. Dan served in the Australian Defence Force for over a decade where he fulfilled a variety of regimental, training and operational appointments as an Army Officer. 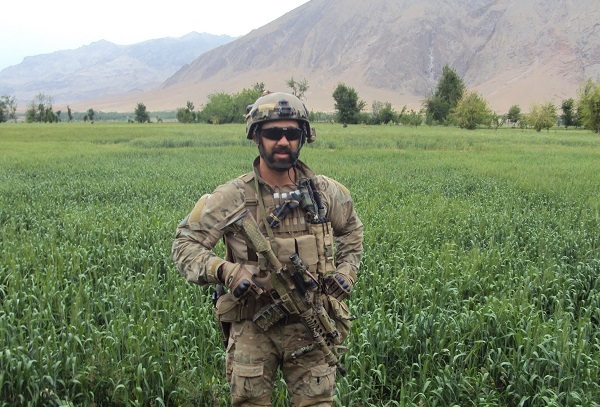 His operational service includes nine months in Iraq during the summer of 2005, where he provided specialist mentoring and coaching to an Iraqi Army unit. Dave had a distinguished career in the Australian Army serving over 17 years. The majority of his career he spent in the Special Air Service Regiment (SAS) until his discharge a couple of years ago. Dave deployed to Afghanistan on six occasions and has spent more than two years all up in this combat zone. He has also deployed to other various and exotic locations with the SAS. During Dave’s first deployment to Afghanistan, his unit was ambushed by a numerically superior foe. During this encounter, Dave was put into the unenviable position of ‘fight or die’. Dave chose the first option and was subsequently awarded the Medal for Gallantry (MG) for his acts of bravery. Bookings for lunch are open now. 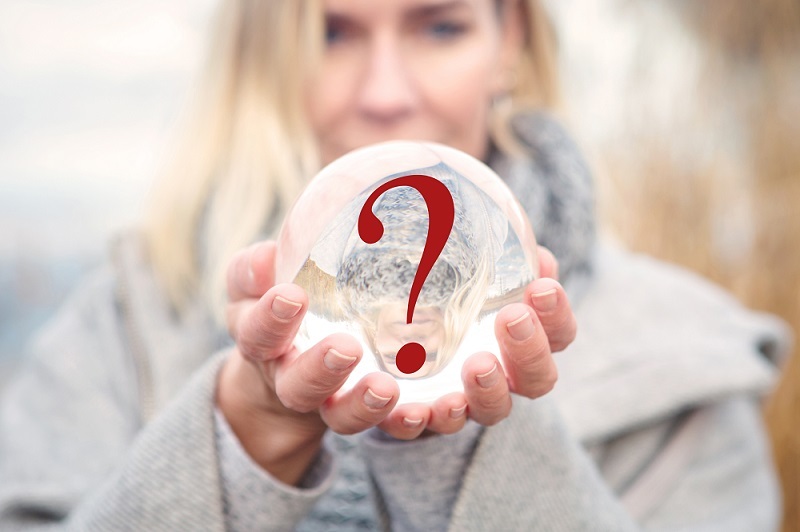 You will not want to miss Fitzroy’s traditional Mystery Ball Games Night in the Community Rooms at BSO from 7pm on 11 August. It’s a night of fun and games run by the players but we can’t give too much away. You are invited to join the extravaganza and $50 will buy you a ticket in the BIG game. You can purchase tickets online. Your ticket price will include the games, your first three drinks, finger food, tea/coffee and music. After that beer, wine and soft drinks will be at our usual bar prices. 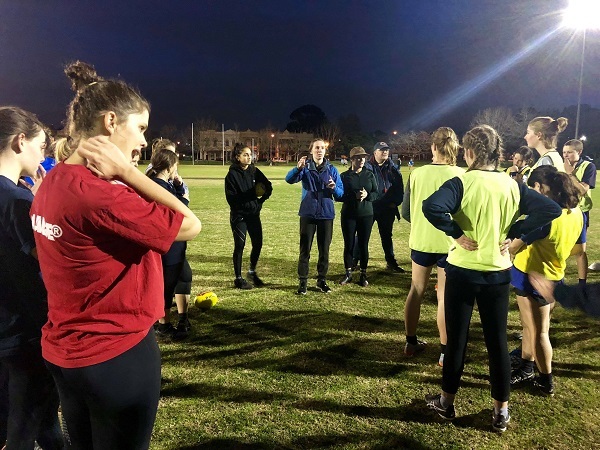 The Fitzroy-ACU Women had the tables turned last week when they had to play coach in a session with the Fitzroy Junior Footy Club Youth Girls side. There was a strong turnout for the senior and junior Roy Girls to get to know each other a little better and to test out some of the senior drills. 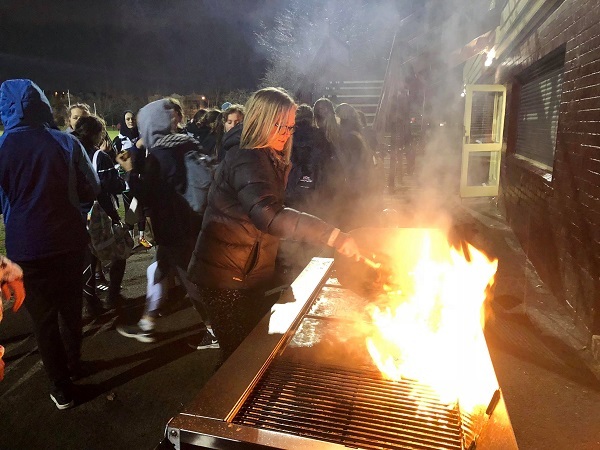 The training session and BBQ at Brunswick Street Oval is just one of several opportunities the players and coaches are creating to achieve greater connections and pathways between the junior and senior clubs. 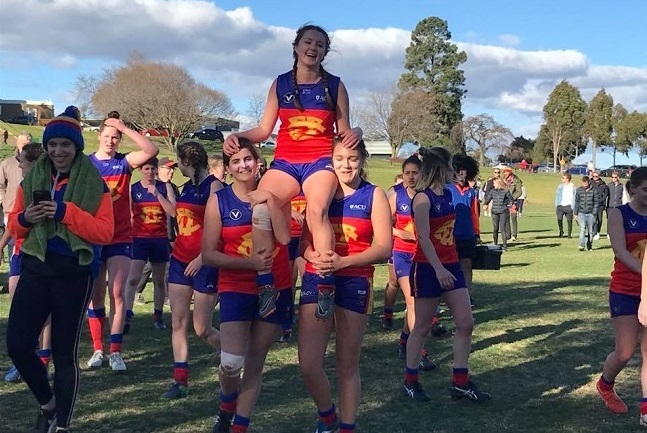 Nicely done Fitzroy-ACU; let's hope we see some of these young stars following in the steps of Phoebe Turnbull and joining the senior club when they become eligible. A special mention should go to Jess Hayes for her outstanding BBQ skills and Cate Rushan for the photos.